The annual Toby Keith & Friends Celebrity Golf Classic in Oklahoma last week set a new record by raising $709,000 for Ally's House, a nonprofit organization that helps families dealing with childhood cancer. 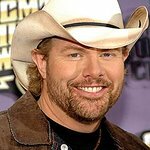 Since establishing the golf tournament five years ago, country music sensation Toby Keith has raised more than $2.3 million for the charity – named after the daughter of one of Keith’s band who died from kidney cancer – and this year was no different, with more than 750 people attending the weekend of sport, music and a celebrity auction. Auction items were donated by stars such as George Strait, Carrie Underwood, Loretta Lynn, Tom Hanks, Tiger Woods, Brett Favre, LeBron James, Andre Agassi, Tony Stewart, and Peyton Manning, although it was the chance to dine with Toby Keith himself that raised the most cash – a huge $35,000.